Ever wondered how to make a perfect bowl of oatmeal in the Instant Pot or on the stove top? With this easy oatmeal guide, you can do both! 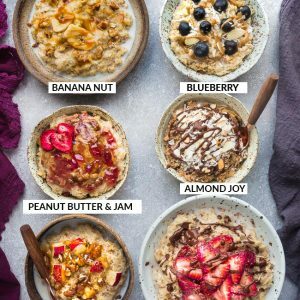 One oatmeal recipe with 6 variations and instructions for both the stovetop and Instant Pot. optional sweetener of choice maple syrup, honey, coconut sugar, stevia, erythritol etc. In a medium saucepan, add the liquid and turn the heat to high. Once the liquid boils, reduce heat to medium-low, add salt and rolled oats. Allow to cook until thick, creamy and plump (about 10-15 minutes depending on desired level of creaminess), stirring every so often to avoid sticking. Serve with (dairy-free) milk and sweetener, if desired. Once base recipe reaches desired level of creaminess, stir in cocoa powder, coconut and sweetener, if using until mixed through. Serve with more milk as desired and top with coconut, slivered almonds and melted chocolate before serving, if desired. Once base recipe reaches desired level of creaminess, stir in the apples, cinnamon (and sweetener if desired) until mixed through. Serve with more milk as desired and top with additional chopped apples and a drizzle of almond butter or date caramel before serving, if desired. Once base recipe reaches desired level of creaminess, stir in mashed banana and cinnamon until mixed through. Serve with more milk as desired and top with fresh banana slices, walnuts and a drizzle of almond butter or date caramel before serving, if desired. Once base recipe reaches desired level of creaminess, stir in vanilla, and blueberries (and sweetener if desired) until mixed together. Serve with more milk as desired and top with fresh blueberries and almond butter before serving. Once base recipe reaches desired level of creaminess, add sweetener (if using), peanut butter, jam and vanilla until combined. Serve with more milk as desired and top with a drizzle of peanut butter, jam, freeze-dried berries and chopped peanuts before serving, if desired. Once base recipe reaches desired level of creaminess, stir in strawberries (and sweetener if desired) until mixed through. Serve with more milk as desired and top with fresh strawberry slices and melted chocolate before serving, if desired. Add oats into the Instant Pot followed by milk.